After gathering a copious amount of knowledge, data and experience from working across several businesses, Nex Mobility offers specialized enterprise mobility services that can give way to newer and more innovative ways of working. Enterprise mobility solutions don’t just mean developing applications that run on mobile phones. They form a part of a comprehensive business solution that when adopted can drive your business to venture into the unexplored business aspects that boosts productivity. Instead of just the introduction of mobile applications, we promote a seamless adaptation of mobility solutions across all business verticals. Our mobile solutions will help to bring a transformation to your business and increase your business productivity by leveraging the areas where a small difference could mean a lot to your overall business performance. Leverage our expertise to improve organizational efficiency with real-time updates and work processes. Embrace Enterprise Mobility Solutions and migrate from a PC based strategy. Leverage the flexibility of Cloud to enhance the productivity of your business and its workforce. Our experts design the ideal Enterprise Mobile solutions to upgrade your technology portfolio. Enterprise Mobility Solutions ensure a consolidated digital communication. Employees are always connected with easy access to web and mobile communication & deliver enhanced productivity. Connect with your customers in real time and provide timely support through your Enterprise Mobile Solutions. Let NexMobility guide you in delivering an enhanced customer experience. At Nex Mobility, we have helped a lot of corporations to grow faster in their tryst to outrun their competitors by generating tailored enterprise mobile application solutions. These solutions have transformed the corporations and the way they work and approach their business responsibilities by maximizing their efficiencies. Not only does it play a part in improving the way your business interacts with enterprise mobility solutions, but it also saves a lot of time, money and effort in the long term. For creating functionality-rich solutions, integration with various other applications is the start of it. We ensure a seamless working from the comforts of your mobile phone and provide access to a lot of data that saves the trouble of accessing multiple platforms for it. UI/UX elements are a necessity to facilitate a smooth experience when you access the mobile applications. With our UI solutions, you can experience an intuitive platform that lets you perform your applications with much as much ease as possible. With the fast-moving world, many want to access the information they want at the blink of an eye. Hence, your applications should also be able to provide the data immediately without any time lags to maximize the use of your applications and we help you achieve exactly that. When information is available easily through mobile solutions, security is one of the major concerns for many. Therefore, we make sure that all your data is solidly secured and accessed through safe channels that leave no room for any security compromises or cyber threats. Managing and strategizing your enterprise mobility solutions have made easy with a quicker turnaround time for new improvements and various options for customization that help you to stay on top of your business needs and get challenges solved as and when you confront them. As a business aspiring for world-class excellence you need partners who will help you embrace technology that transforms your business processes. 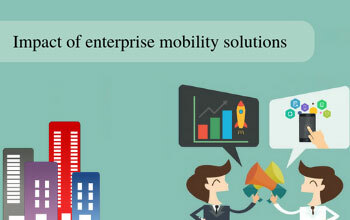 NexMobility provides superior quality Enterprise Mobility Solutions that will redefine your technology roadmap. Owing to our expertise and exhaustive experience in multiple domains and in-depth understanding of the benefits you can leverage from enterprise mobile solutions, makes us your right technology partner. We design uniquely crafted cross-platform mobile solutions that effectively connect employees to data & enterprise processes seamlessly. Our Enterprise Mobility Solutions host a completely intuitive interface that is easy to comprehend and navigate. We provide customized solutions to meet your specific requirements. Our comprehensive testing practices helps maintain the quality standards of your applications. We integrate critical information from heterogeneous enterprise systems into a central interface to ease in business decision making. We focus on the essential mobile app security best practices of malware protection & prevention of unauthorized access to ensure that you enjoy a streamlined experience. Through our Enterprise Mobility Solutions we focus on synchronizing all data storage & retrieval process thus ensuring complete cost-effectiveness. At Nexmobility we adopt a comprehensive approach towards domain understanding. We implement our understanding in helping you gain the best benefit for your business. Our Enterprise Mobility Solutions help large enterprises or small startups improve their business efficiencies. We have displayed expertise in managing large enterprise applications to effectively deliver enhanced cost-effectiveness for your business. We have worked across multiple domains including Healthcare, Finance, Travel, Ecommerce, Field work, Wellness and Fitness, Retail, Education, Technology and many more. For every business it is utmost important to adopt new techniques, and include newer strategies in their business which help them to gain more and more revenue. Needless to say, revenue is one of the main things which matter to a business, hence, they leave no stone unturned to boost the profits.